Check out our new YouTube Video for some of this weeks latests travel deals! This entry was posted in Uncategorized on July 12, 2018 by Megan Przychodzien. Naturally, my husband and I, being the wine lovers that we are decided to stop by to see what Wine Bar George had to offer. The amount of wine available is impressive. 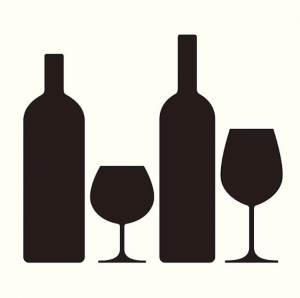 Guests will find the wine menus divided into sections..Reds, Whites, Outstanding by the Ounce, and George’s Finds. As we ordered, we chatted with the bar server and the sommelier for some recommendations, asked about varieties that we liked, but didn’t see and for other tips. One thing I noticed right away was no mention of a wine flight option…and that is because even though the menus don’t list it, you can get all of the options you see in 1 ounce, 3 ounce or 6 ounce pours. This makes it simple to create your own wine flight, which is exactly what we did. George’s Finds are “on draft” so to speak while the Outstanding by Ounce are liable to break the bank depending on your palate. 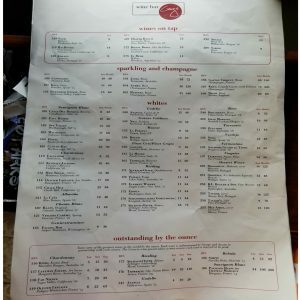 As you can see from looking at the wine menus, there is a range of everyday favorite table wines like Kendell Jackson or Jam Jar, to the highly prized wines that come with the high price tag. 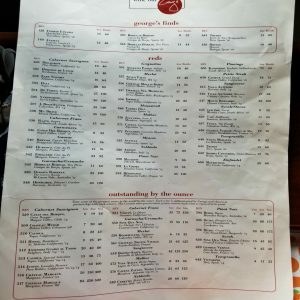 Surprisingly, there was a distinct lack of French Wines & Italian Wines available, more specifically Chateneuf de Pape, Cote du Rhone, Bordeaux and the Montepulciano Wines. This was a disappointment on our part, as we expected a more balanced menu in terms of various regions. But they have only been open about 3 weeks and, if I had to make a guess, they are trying to see what is going to sell. In addition to the wine only menu there are small plates available such as charcuterie boards, hummus, burrata, house made meatballs and crispy mac and cheese bites to name a few. Seating is available both downstairs and upstairs, but I highly recommend heading upstairs for a less cramped feeling and for the great view. Keep an eye on their social media because they offer wine tastings from time to time as well. Overall, we loved spending a little over an hour here, people watching out the front windows, sipping our wine, seeing what flavors we could pick out and just generally relaxing. Adults, this is a great place for a date night or even a pre or post dinner drink if you’re headed elsewhere in the Springs. I think our favorite wine out of the selection below that we tried was the Villa Antinori. Antinori wines never disappoint. 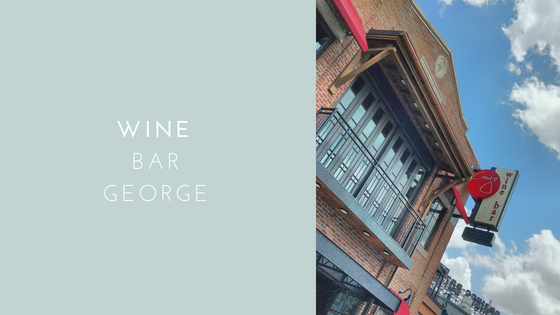 Next time you’re around Disney Springs be sure to stop in and try a glass. If you have any questions, I’m always available to help you! Feel free to contact me at Carrie@MustLoveTravel.com. Blogger, Traveler, Wife, Runner….I’m known as many different things. 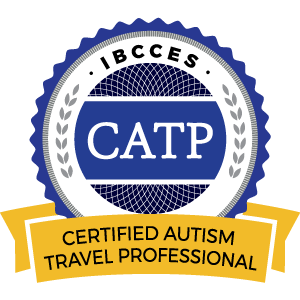 But I’m here to be your Travel Professional. Ever since I was a little girl I had an interest in travel. I would collect the postcards books that my grandparents brought back to me from their travels and I kept them in a special box that I loved to pull out and flip through. As I traveled with my family I started collecting postcards on my own and pictures, maps, and other mementos of my travels. 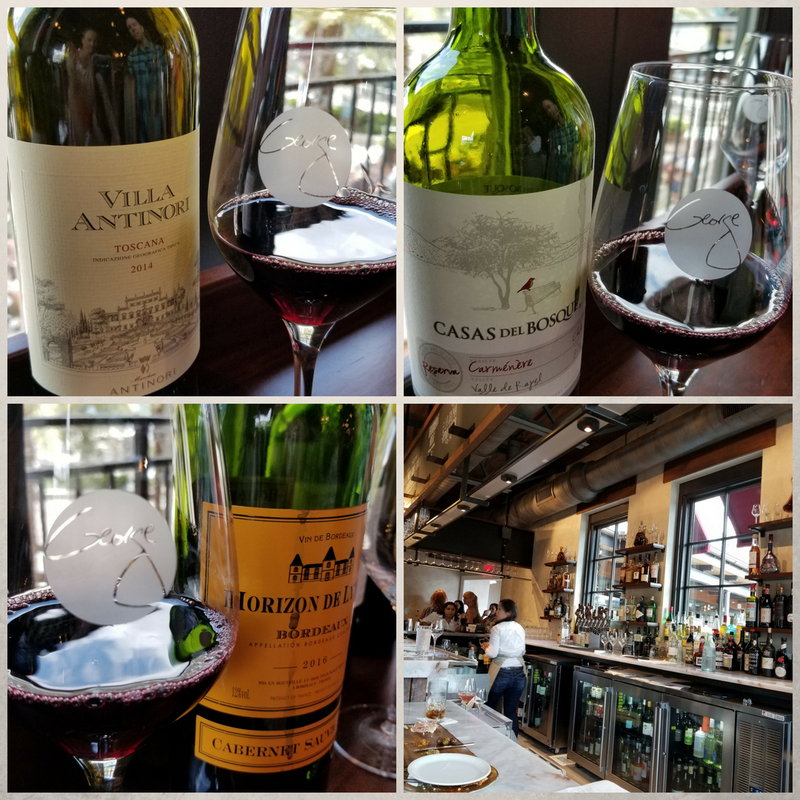 This entry was posted in Disney Vacation, Downtown Disney, Uncategorized and tagged adult walt disney world, Carrie Bryniak, Disney Springs, Walt Disney World, Wine Bar George, Wine Tasting on June 18, 2018 by Carrie Bryniak. There are six islands that make up this wonderful state and each island has its own personality and desired experience. Besides the wonderful year round weather, tropical yumminess, Hawaii is full of wonderful places to visit. In this post, I want to take you to the Heart of Hawaii –Oahu. There are 5 regions of Oahu which include, Honolulu, Central Oahu, Leeward Coast, North Shore and the Windward Coast. The island is a perfect mix of the ancient and the modern infused with the Hawaiian culture and experiences. I plan to travel to Hawaii this fall, and Central Oahu has been on my bucket list for years! Pearl Harbor has its draw that any American would be proud to stand foot on. A moment in time that changed the course of history. Walking the harbor, hearing the stories from survivors, and taking it all in would be a moment no one could ever forget. Planning your day there will require reservations and great walking shoes! The Passport to Pearl Harbor will allow you to see it all. If you are more adventurous, the North Shore will transport you into the world of the surfer. You will want to go between November and February for the big waves, but don’t plan on riding those as they should be left for the professionals! During the rest of the year you will see a more calm ocean. Haliewi is a perfect little surfing town where you can shop, eat and enjoy! Not far down the road you can visit the Polynesian Cultural Center and the old plantation town of Kahuku. Whale watching is another favorite among tourist. December to May you will find these beautiful Humpback Whales, however February is peak season. These whales are considered native to Hawaii as this is where the vast majority are born. For the Hawaiians these animals are treated with great respect. 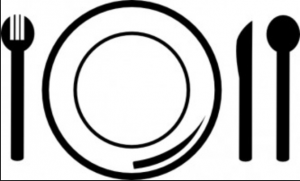 ONO! A word you will use often. It means delicious. When you look at the culinary journey you will take on a visit to Hawaii you will be in heaven. 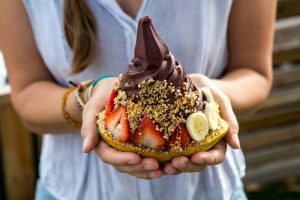 Not only is Hawaii rich with their own flavors, but it is a melting pot for many of the worlds wonderful culinary treats. Don’t miss out on the local out of the way places and make sure you don’t pass on all of the street foods! Rounding out a perfect stay on Oahu is to dive into Honolulu. With cultural arts, food and shopping you can explore for hours! Staying on the famous Waikiki Beach where with Luau’s and beautiful views will take you back in time, perhaps staying at the Moana Surfrider, Waikiki’s first hotel will offer the nostagia you might be looking for. Stay tuned for more on Hawaii. More islands, in depth look at its culture and more! This entry was posted in Hawaii, Travel Planning, Uncategorized on January 27, 2018 by Rick Howard. St. Clair Brown is an urban winery and brewery in the city of Napa. You’ll find tables and chairs located outside its quaint greenhouse and in the gardens itself. 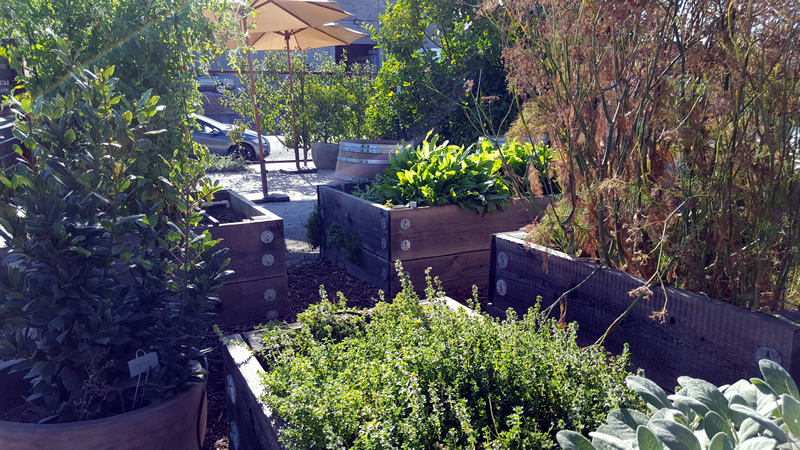 You can sample brews or wine, along with some tasty treats made from locally sourced ingredients and the on-site garden. We were first introduced to St. Clair Brown a couple years ago during a small group tour to boutique wineries. We fell in love with atmosphere, the dedication to local ingredients, and the fact that the owners themselves were the ones to conduct our tasting. Having some time on a recent trip we decided to visit our favorite once again. We were nervous to go back, because you know how sometimes, you remember things differently than they actually were. You have those rose colored glasses and then you go back and you can’t remember why you liked that place? I’m happy to report that was ABSOLUTELY NOT the case with St. Clair Brown. It was just as unassuming, friendly and tasty as we remembered. The staff greeted us warmly, inviting us to grab a seat wherever we wanted in the garden. Locals were perched around the area reading books, relaxing with friends, their dogs at their feet…always a good sign in my book! 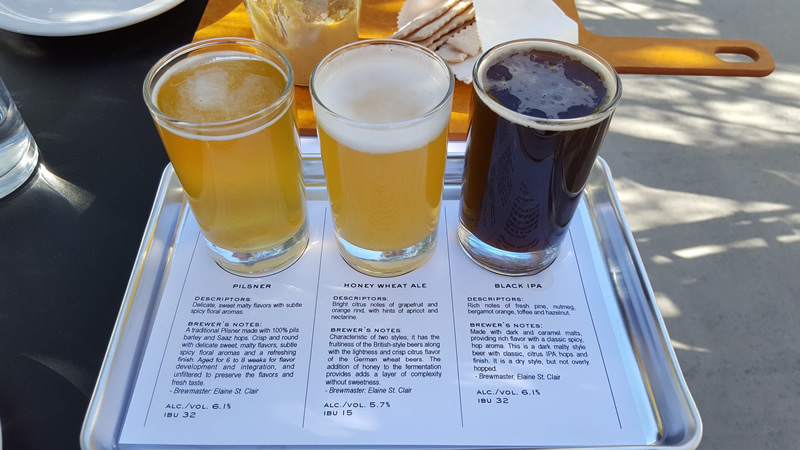 We already knew we liked the wine, so we decided to try the beer flight this time. To accompany the 3 beers you see in the picture we ordered hummus and crackers. Again, remember that things are locally sourced and the chef puts her own spin on things. For instance, instead of using chickpeas for the hummus, she was using peanuts as a base, with lemon flavored olive oil from a local supplier. The first thing that hit your tongue and made it water was the flavor of the lemon and the finish was excellent. The beer options did not disappoint. Typically my husband is not a stout fan if we’re in the States because of the heaviness of it. That was the whole point of the stout brewed here though…it was the taste without the full stomach feeling that you just ate a loaf of bread. As we tested our beers we chatted with staff and asked about their upcoming releases. This winery was where we finally found a California Chardonnay that we liked and we were disappointed to learn they were sold out of it. Their upcoming releases intrigued us so much we decided it was time to join their Wine Club. We had pondered it a couple years ago, but never made the move to do it. Now was the time, and we celebrated with a glass of Sauvignon Blanc…a free one, as a Wine Club Member benefit. If you’re in the area of Napa, you HAVE to stop by this winery. It’s worth your time, trust me, we wiled away a couple hours here just relaxing and enjoying watching the Wine Train go by. 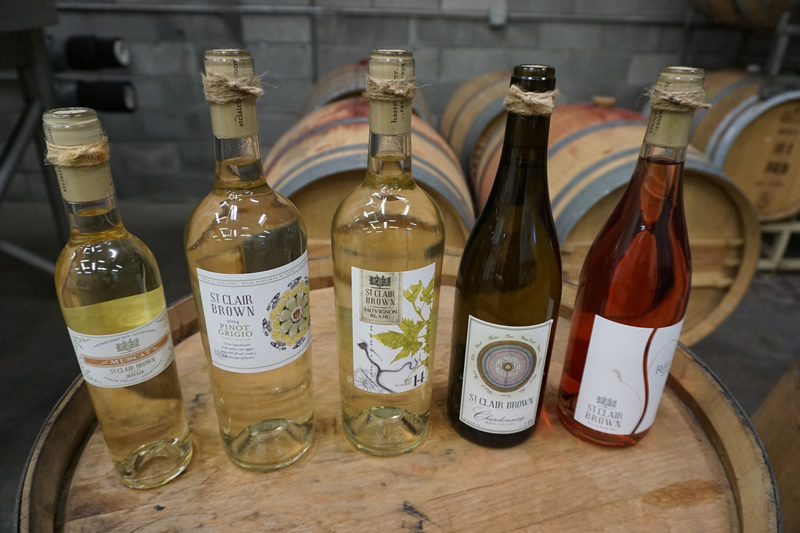 This entry was posted in Travel News, Uncategorized and tagged Carrie Bryniak, carrie's Getaways, Must Love Travel, Napa Valley, St. Clair Brown, Wine Country, Wine Travel on January 25, 2018 by Carrie Bryniak. What happens when everything is just not perfect on your vacation? Traveling can be fun, but it also can have hiccups along the way. The first thing you should remember is that unfortunate hiccups don’t have to ruin a trip if you don’t let them. There are things in life that we just sometimes cannot control, but approaching it with solutions can help ease any disappointment. Before you go, be prepared. Your travel planner will help you to know what documents you need and general expectations of your trip. Make copies of the documents, and keep them with relatives or friends that can be easily contacted should you need them. Call credit card companies if you are traveling out of the country so you won’t get caught not being able to use your credit card. Always purchase a good trip insurance policy. Travel delays and cancellations. They are bound to happen at some point in your life time of travel. Travel Insurance is your savior in this situation. By purchasing travel insurance many of the policies have trip delay or even cancellation. 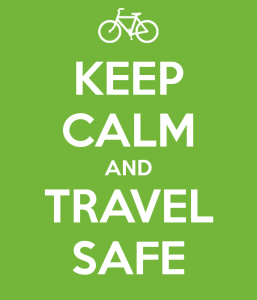 Often this includes loss of excursions or tours you may have booked during the time you are now not going to be there. Depending on your policy, you may recover this loss. Resort/ Hotel issues. Your travel planner can advise you here, but your first line of defense is discussing your issues with the Front Desk Manager or Hotel Manager. There are few things that happen that can’t be resolved. Approach the situation to bring resolution, not to just get something for free. Things happen, rooms are not made up on time, a maid forgot to leave more water, room service was running slow, etc. Always keep the details with you; names of who you spoke to, times and dates. Your travel planner can sometimes advocate for you when you have this information, but it always easiest to resolve in person. Weather. Well none of us can predict the weather when planning a trip. Be prepared by checking the forecast as your date approaches. You can make some adjustments to excursions, and tours, but for the most part I would stick with your plans. If you should encounter a major weather issue your travel planner can help you navigate through it. Keep their number close at hand. Travel well, be prepared, and don’t let any issues get you down. This entry was posted in Uncategorized on January 13, 2018 by Rick Howard. 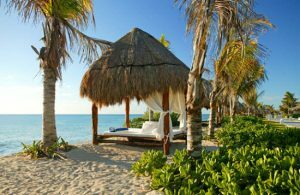 As one of the most popular tourist destinations in Mexico, Cancun attracts about four million visitors each year to its pristine white beaches, its top-notch resort and hotel scene and its crystal blue water. The city is home to hundreds of hotels that line the beaches in an area called the hotel zone, attracting all types of guests, from traveling business people to timeshare owners to families. The city is probably most famous for its Mayan ruins, which dot the landscape around this southern region of Mexico. From El Rey to Tulum, the ancient stone remains are unique archaeological attractions that tell the original story of the now bustling modern city. Many people also visit the area for its great dive sites. 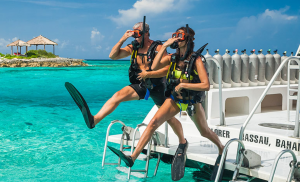 Colorful coral reefs and diverse sea life are located right offshore, and a variety of inland cenotes (deep natural wells) attract diving enthusiasts to explore the rich underwater worlds of Cancun. Couples looking for a luxury wedding or a spicy celebration bursting with entertainment will find what they want in Cancun. Convenient to travel to from origins throughout the U.S., Cancun was designed with the needs of a tourist in mind, which makes it easy to design a dream wedding experience. Including a traditional Mariachi trio during the destination wedding cocktail hour adds a beautiful and soulful soundtrack to make sure guests never forget their incredible experience. Or hosting the reception at sunset on a catamaran allows guests to enjoy the wedding and a breathtaking Mexican sunset at the same time. This entry was posted in Uncategorized and tagged cancun, Cancun Mexico, mexico on December 30, 2017 by Rick Howard. The ocean is quietly rumbling toward the shore as the sun rises over the Gulf of Mexico. The birds are talking their language to one another as they show off their bright colorful coats. The workers are quietly getting the pool area and all the gardens with precise detail. Perfection! Is there such a place? Yes! A true romantic getaway! This week I have been staying at the El Dorado Casitas Royale in Mexico. Our room, the Infinity Pool Swim up suite the perfect indulgence for a quiet time away from the everyday life. Staying in this section of the resort your room is in a U shaped section that has its own swim up pool and bar. This section also hosts a small cafe for sandwiches and various shakes. Your room has its own pool with access to the lazy river that will take you to the main pool and bar and not to mention just short steps away from the beach where you can relax in a cabana or beach lounger. You Beach/Pool Butler will be attending to whatever you need. 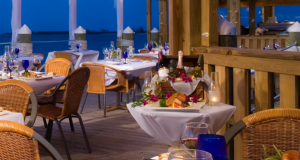 The Karisma resorts are award winning Gourmet Inclusive resorts. 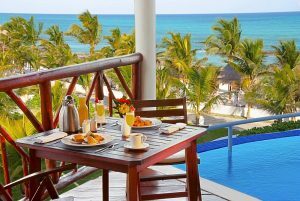 From excellent gourmet food, premium drinks, activities and especially the personalized service you can expect when staying at any of their resorts. Fresh vegetable and spices are grown in their own 70,000 square foot greenhouse located at the El Dorado Royale. There is a variety of 15 dining locations and 24 room service so you are sure to never go hungry. Two of our favorites were Kampai and D’Italia. They also feature Fuentes which is a culinary theater. Activities and entertainment are also available if you want to mix and mingle about. So here is the question……You want to go on a romantic getaway, but how do you choose? There are so many different resorts and destinations that it does make it difficult to choose. I look at the brand first. What do the brands offer? Are there hidden fees? What level of service do you receive? You typically have consistency throughout a brand. Like Disney Destinations, something we are all familiar with, you can see that whether you go to Disneyland or Walt Disney World you will have some consistency in the level of service and what the brand has to offer. There may be some differences just because of location, but overall they are similar. The same is for the various all inclusive or in Karisma’s case, gourmet inclusive brands. You will see similarities in all Sandals, Excellence Resorts, Palace Resorts, Secrets, and so on. Also, look for adult only resorts for romantic getaways. 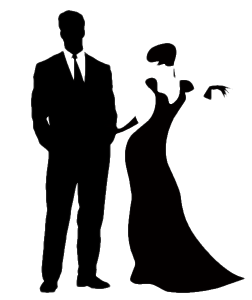 When planning romance – adult only is the way to go! Budget is usually pretty high on the list when picking out a resort and destination. Be willing to pay a little more to receive more. You can save on such things as room category or go during low season such as Oct., Nov. and early Dec. Nothing can be worse than spending money on something and the experience doesn’t match up. Plan ahead! There is a time and place for last minute getaways, but when you are planning your honeymoon, anniversary or just that special getaway plan early! This will allow you to deposit your trip and pay a little bit along the way. Planning ahead allows you to stretch the budget a bit to get what you want. Destinations such as Mexico, Punta Cana and Jamaica are usually the most cost effective when looking at airfare and resort packages. Consider going with a group. You may receive a discount when traveling with a group. Talk it up with your friends or family! It takes 5 – 10 rooms to create a typical group. You can check with your travel planner about those possibilities. Groups make it fun and yet you still have alone time . When you are away, you will know what it means to relax and enjoy! All- Inclusive is a no worries vacation. Don’t just search the internet though. Work with a travel professional so you will be sure to get the perfect resort and destination. 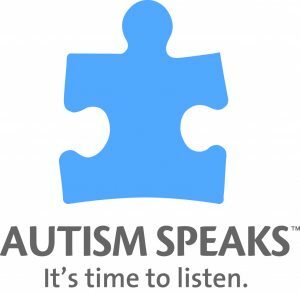 They are there to guide you, answer questions and be your advocate. If you haven’t experienced an “adult” time away you need to! Destination Weddings, Honeymoons, Anniversary or just because ….you choose the reason and let us help make it happen! This entry was posted in Uncategorized on December 9, 2017 by Rick Howard. 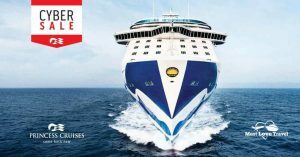 Princess Cruise Line Cyber Sale! Looking for a great cruise deal then look no further, Princess Cruise Line is running a fantastic Cyber Sale deal. The offer will end on November 29 so you will want to contact an agent soon to take advantage of this sale. The sale gives you two options to choose from so you can pick the one that best suits your traveling schedule. The first is called “Sail Soon”. With this deal you can sail from this winter of 2017 through Spring 2018 and will save up to $1,000 per stateroom. The second is called “Sail Later”. This gives you the option to cruise from Summer 2018 through Spring 2019 and everyone in a stateroom would enjoy a free stateroom location upgrade, free gratuities on select services and free onboard spending money up to $500 per stateroom. Looking for a great Christmas present for your family, why not give them the gift of a Princess Cruise! There is so much to enjoy such as movies under the stars, theater style productions, expansive spas and fitness facilities, kid’s clubs, casinos, discos, night clubs and a mix of culinary themed restaurants. Princess is the first line in the Carnival Corporation fleet to introduce the Ocean Medallion. Seven ships will be outfitted with this technology. The device which was created by innovator, John Padgett who created Disney’s Magic bands. This wearable disc will serve as a virtual concierge which can be used to book shore excursions, order food to be delivered poolside, locate friends and family throughout the ship and streamline embarkation and debarkation and much more. 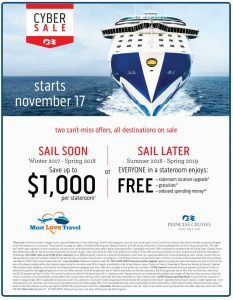 With the Cyber Sale that is going on now there has never been a better time to plan your family cruise! This entry was posted in Uncategorized on November 24, 2017 by Megan Przychodzien. Best Cruise Tips to Make the Most Out of Your Next Cruise! A cruise is a wonderful and relaxing getaway. Here are some tips to make your next cruise even better! 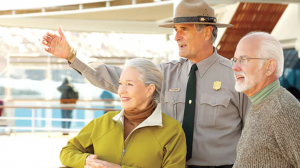 A wonderful perk with cruising is that typically you drop off your bags upon arrival and your cruise line will take care of delivering them to your cabin for you. This is a great convenience and allows you to enjoy exploring the ship without being weighed down with all your luggage. However, it can take awhile until you get your bags back, often you may not see your bags until that evening. With this in mind it is smart to plan ahead and pack anything you may want with you for that first day in your carry-on bag. Examples of some items you may want to have might be a change of clothes, your swimsuit to enjoy the pool, chargers, any medicines you may need, sunscreen, ect. Depending on your Cruise Line’s regulations, some ships do allow you to bring a certain amount of alcohol onboard. Usually up to 2 bottles of wine are allowed per cabin. Bringing your own beverages to enjoy in your cabin can save you a significant amount on your bar tab. Passengers typically pick up their bottles at their arrival airport’s duty-free shop. Pack your bottles in your carry-on and you will get through security with no problems. You can check on your Cruise Line’s website or ask your travel agent to find out the exact alcohol regulations for your specific cruise ship. If excursions are important to you and your party you may want to consider requesting the late dining seating. This is important because the shore excursions often do not make it back in time and could conflict with the early seating. You wouldn’t want to miss out on your dinner! If the late dining option is something you want be sure to request it or tell your travel agent as soon as possible to guarantee your spot. Everyone knows to pack any medications or toiletries that you use on a daily basis but it is also important to pack those “just in case” items. For example, allergy pills, Advil, motion sickness medications, additional sunscreen, ect. 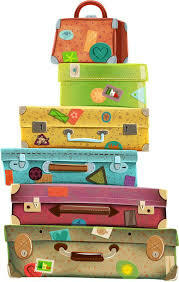 Many people like to just pack what they know they will need and say that anything else they will just buy on the ship. However, toiletries and medicines like these can cost up to 10 times more on the ship. That’s why we strongly recommend bringing these items yourself. They don’t take up that much extra room in your suitcase and if needed you will be happy you already have it and don’t have to pay an arm and a leg for it. Don’t Miss the Boat! – Literally! Many travelers plan on arriving to port the day their cruise vacation begins. However, it’s important to plan ahead for the unexpected. 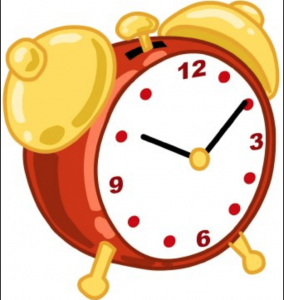 If you are flying in from out of town, what if your flight is delayed? What if there is traffic? Unlike other vacations when you know your hotel will be there whenever you get there, with a cruise your ship may sail without you. For this reason, it is a good idea to consider arriving the day before and spending the night at a hotel near your port. This can make the start of your vacation much more relaxed and stress-free not having to rush and possibly missing your cruise. Hope these simple tips help you in making your next cruise more even enjoyable! Happy cruising! This entry was posted in Uncategorized on October 22, 2017 by Megan Przychodzien. Going on a cruise vacation is an exciting adventure! You and your traveling party have an experience ahead of you full of discovery and relaxation! With your Must Love Travel agent handling all your travel details all you have to do is sit back, enjoy and of course pack your suitcase! Today we are going to look at a few key points to keep in mind to make the process of packing for your next cruise easy and fun! 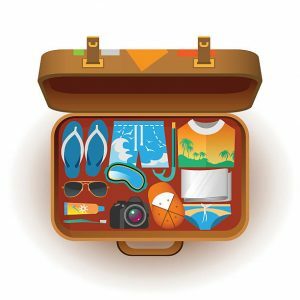 A lot of what you pack for your upcoming cruise should be based on where you are headed. Are you experiencing the breathtaking wildlife of Alaska? Or will you and your family be soaking up the sun on a beach in the beautiful Caribbean? These two destinations are examples of very different climates. It’s important to research prior to packing your clothing what the weather will be like during your cruise so you know what to prepare for. You can always turn to your Must Love Travel agent for advice. With our agents experience and vast knowledge of many destinations they can give you great input on this matter. We have all heard the classic saying, “It’s better to have it and not need it, than to need it and not have it.” These are wise words to keep in mind when packing. For example; it can be smart to pack additional toiletry items such as medications, allergy relief and first aid products. You never know when you might be in a situation that one of these items could come in handy. Another ‘just in case item’ might be a light sweatshirt jacket. Even if your heading to a sunny, tropical destination it’s important to avoid only packing shorts and tee shirts. You should always prepare for if it might be breezy sitting out on the rooftop deck one evening, or if the AC is on high in the dining hall. A light jacket is always great to just have on hand. It’s important to research or ask your agent about any dress codes that might be present on your ship or at certain onboard restaurants you plan on dining at. Some restaurants have a formal attire dress code. Being aware of any policies will help you chose what outfits to bring. Another item to pack for your cruise is a pair of sneakers. I know personally I love to live in my flip-flops when on vacation! However, when cruising some activities or excursions require appropriate closed-toe footwear. Bringing along your favorite sneakers is a smart choice to guarantee you will be able to participate in all events and activities. 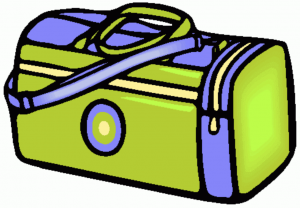 Some cruise lines have limits on how many luggage bags you can bring and restriction on the size and dimensions of your bags. Being aware of this and checking the size of your suitcase at home prior to arriving for your cruise will save you a lot of time and hassle at the port. It’s also crucial to be aware of any restricted items that are not allowed on the ship. You don’t want to risk having any of your items confiscated by the cruise line. 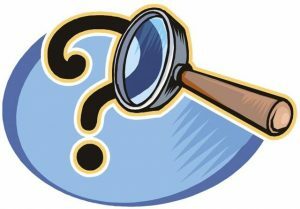 You can find information on what you can and can not bring on your cruise line’s website or by asking your agent. This is a great tip for whatever kind of trip you are going on. Make sure you have just what you need and try to avoid over-packing. Think about what you will absolutely need and stick with the basics. Travelers typically always return with more items than they depart with. You want to leave extra room in your suitcase to be able to bring home souvenirs and gifts! Stick with these guidelines and you will be a packing pro for your next cruise! Stay organized, smart and have fun! Packing always symbolizes the beginning of a great adventure ahead! This entry was posted in Uncategorized on October 12, 2017 by Megan Przychodzien. Leave a copy of your itinerary and passport data page with a friend or family member back home so you can be contacted in case of an emergency. Know and respect the laws in the country you are visiting. o Remain alert to your surroundings at all times. Follow your instincts and avoid any areas or situations that seem as though they could become dangerous. Avoid all demonstrations, as even peaceful ones can quickly become unruly and a foreigner could become a target of harassment. If caught unexpectedly near a 4 demonstration, obey instructions from police and leave the area as quickly as possible. Ask tour guides and hotel officials about any planned demonstrations in the locations they plan to visit. Do not display expensive looking jewelry, large amounts of money or other valuable items. Also, do not leave luggage unattended in public areas and do not accept packages from strangers. Check with your cell phone provider prior to departure to see if your phone is capable of roaming on GSM or 3G/4G international networks. 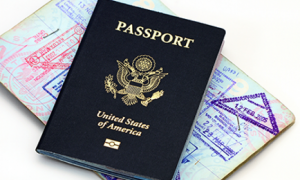 Check your medical insurance coverage to make sure it applies overseas. If it doesn’t, consider buying travel insurance that covers overseas medical attention and medical evacuation. Do not display large amounts of money. Place small amounts in different pockets to assist with this or use credit cards or travelers’ checks. Make copies of your credit cards front and back and place them in a secured place for your records (room safe). This can be very useful if you need to report a lost or stolen card. If you see something suspicious, call 911 immediately. When you return to your hotel, use the main entrance especially in the evening. Be wary of solicitors. Use reputable places of business for all your entertainment transactions. Travel in pairs or groups if possible. Always have a meeting place for the kids to meet you if they get lost. Small children should have their name and phone number placed on their clothes label or the inside of a shoe flap with a permanent marker in case they are lost. Small children should always be led by the hand when crossing the road or near busy streets. Teach your kids your name, house phone and cell phone number. Use the sidewalk and pedestrian crossings. This entry was posted in Uncategorized on October 10, 2017 by Rick Howard. A cruise vacation is an adventure to remember. A cruise allows you to travel in luxury and relaxation as you see new parts of the world! Princess Cruise Line is a leader in the cruise line industry for outstanding quality and value. 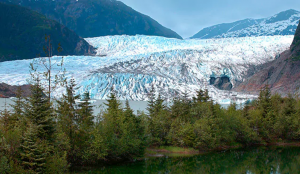 Princess Cruise Line offers a wonderful itinerary for Alaskan Cruises. The cruise portion of your journey allows you to take in the grandeur and beauty of the State’s natural wonders while traveling in comfort and style. What sets Princess Cruise Line apart from other cruise lines is their amazing port excursion offerings. 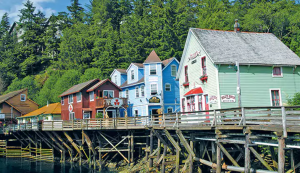 These excursions allow you to take in the lifestyle of Alaska through experiencing the local cuisine, touring with the locals, and getting up close to Alaska’s amazing wildlife. Princess’s moto is “Come back new.” Travel allows us time to reflect, relax and grow through new cultures and experiences. By taking a Princess Cruise adventure you and your family are sure to come back refreshed and new! 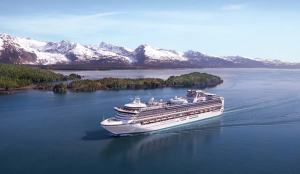 Contact your Must Love Travel agent today to find a sailing that fits what your looking for in an Alaskan Princess Cruise. This entry was posted in Uncategorized on September 10, 2017 by Megan Przychodzien. When you are looking for the ultimate Caribbean getaway, look no further than a Sandals Resort! It is an authentic Caribbean experience. There are no hidden fees at a Sandals Resort. When they say all-inclusive that is exactly what they mean. 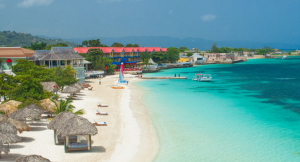 Let me go over some of the things you can experience at a Sandals Resort. All activities are included! Sandals has the largest private fleet of boats in the Caribbean which can take you on many boating adventures. Certified divers can dive for free every day. Also enjoy snorkeling, fishing or paddle boarding. There are many opportunities for fun on the land. Sandals has wonderful fitness centers, tennis facilities and for the golf lover there is unlimited golf included. There are also private offshore island excursions at no extra cost where you can relax or play in a beautiful paradise retreat. If you are looking for a destination wedding look no further. Sandals has what you are looking for in a beautiful romantic wedding. 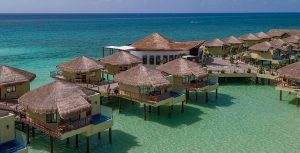 Sandals boasts 16 restaurants per resort! You can dine wherever and whenever you want at no extra cost. Unlike other resort,s there are no seating times. You can eat whenever you wish and also all drinks are included 24-7. So if you are looking for a relaxing Island vacation consider Sandals Resorts for you next getaway. Contact your Must Love Travel Agent today for a quote and to find out more about the incredible value you receive by staying at a Sandals Resort! This entry was posted in Uncategorized on August 26, 2017 by Megan Przychodzien. 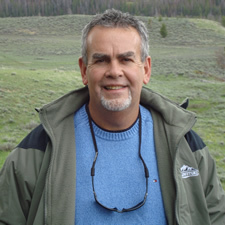 I’m Rick Howard, President Must Love Travel Group and host of the video and travel blog, Travel with Rick. This blog will feature stories and video from all the places we like to travel. 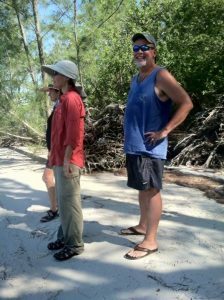 From our back yard in the Florida to Keys to the far side of the world on tours and cruise vacations. We love what you love, great food, interesting and relaxing locations and discovering the world through travel. 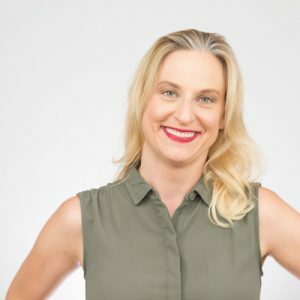 I look forward to sharing my travel adventures with you as well as those of friends, our personal travel planners at Must Love Travel and our guests. This entry was posted in Uncategorized on May 26, 2017 by Rick Howard.